Objective – This article describes how librarians systematically compared different e-book platforms to identify which features and design impact usability and user satisfaction. 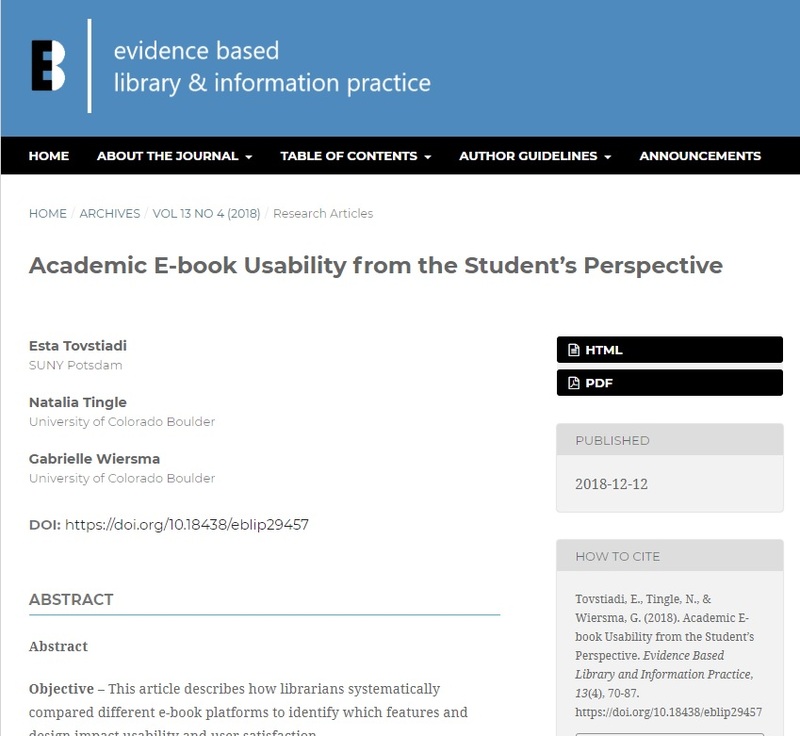 Methods – This study employed task-based usability testing, including the “think-aloud protocol.” Students at the University of Colorado Boulder completed a series of typical tasks to compare the usability and measure user satisfaction with academic e-books. For each title, five students completed the tasks on three e-book platforms: the publisher platform and two aggregators. Thirty-five students evaluated seven titles on nine academic e-book platforms. Results – This study identified each platform’s strengths and weaknesses based on students’ experiences and preferences. The usability tests indicated that students preferred Ebook Central over EBSCO and strongly preferred the aggregators over publisher platforms. Conclusions – Librarians can use student expectations and preferences to guide e-book purchasing decisions. Preferences may vary by institution, but variations in e-book layout and functionality impact students’ ability to successfully complete tasks and influences their affinity for or satisfaction with any given platform. Usability testing is a useful tool for gauging user expectations and identifying preferences for features, functionality, and layout.